An apple a day might keep the doctor away, but hospitals now are bringing local fruit directly to their patients. Farms and gardens are sprouting up on hospital grounds all around the country. Health Care Without Harm’s Healthy Food in Health Care, a program focused on helping hospitals offer their patients healthy foods, has started to notice that hospital grown produce is becoming increasingly more common. 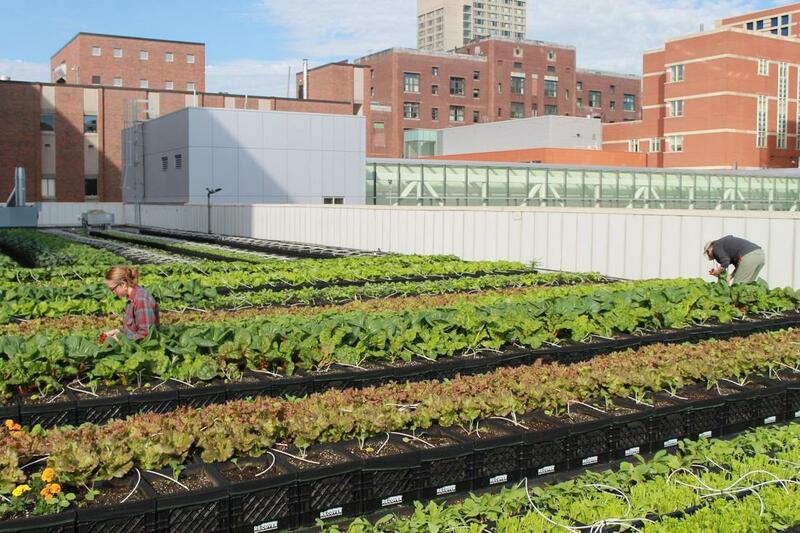 One New England hospital, Boston Medical Center (BMC), has become a leader in this movement and recently set up a farm on top of their building. Not only is it the largest rooftop farm in Boston, but the sky-high project is also the first hospital-based rooftop farm in Massachusetts. Kids from BMC's Culinary Summer Camp have been touring our rooftop farm this week, harvesting crops and then learning how to prepare meals in the Demonstration Kitchen with what they gathered. Close to 1,800 pounds of crops were harvested from the rooftop farm in June alone! The 7,000 square foot farm hopes to generate 15,000 pounds of food every season and has already produced 1,800 pounds since June. Some harvested items will include kale, bok choy, arugula, tomatoes, carrots, eggplants, cucumbers, and peppers. The rooftop also has a set of two new beehives that will produce honey for the hospital. So who will be able to enjoy all this fresh food and honey? The hospital’s patients, of course, but BMC has also found several other uses for the farm. The hospital has a Demonstration Kitchen which allows people to visit the rooftop and learn about cooking with seasonal and healthy ingredients. The program helps people get hands-on experience to learn how to grow food as well. The farm also benefits BMC’s preventative food pantry which gives low-income patients access to fresh food. The motivation for the rooftop garden was a no-brainer for BMC. With access to a farm just steps away from the kitchen, BMC can minimize carbon emissions produced by transporting food. On a practical level, the increased green space also helps reduce the building’s energy use and manages stormwater runoff during heavy rainfall. With endless educational, environmental and health benefits, the rooftop farm offers not only a way to decrease BMC’s carbon footprint but also help their community. Last week, BMC's bees were moved to their colorful new beehives, which were painted by our pediatric patients. The bees are stationed on the rooftop farm, where they will pollinate crops and provide honey for the hospital community. Since doctors and nurses don’t have time to roll up their sleeves and start growing plants, BMC teamed up with experts Lindsay Allen and John Stoddard from Higher Ground Farm (HGF). HGF specializes in designing and installing organic rooftop farms in the Boston area. BMC works with a farm manager to oversee the crops. BMC's sustainability efforts don't just stop there. They're also planning to use solar power and hope to become the first carbon-neutral hospital in New England by 2018. Several environmental groups have already acknowledged the hospital's green efforts, and BMC was named one of the 50 greenest hospitals in America by Becker’s Hospital Review. So far, BMC continues to focus on providing their community organic fresh food and is on target to produce 5,000 pounds of produce by the end of the year.